It's never easy to say goodbye to your pet. I have done it so many times, today I'll share a story about when I wish I had a Paw Pod. Gizmo was my shih-tzu. My husband bought him for me for Valentine's Day in 1996, the year we got married. He was 8 weeks old, and the cutest puppy ever. People would stop and ask us where we got such a cute dog. Gizmo traveled the states with us when he was 3 years old, we drove across country and all up and down the west coast. When we moved to Los Angeles, my husband and I only had him, we were married for 10 years before kids, so to us, he was our baby. In L.A. we would take him to dog parks, and to the Malibu beach, and Santa Monica Pier...the long train on Venice Beach..he went everywhere with us. When Xander was born, he loved him, he would curl up and sleep next to Xander every night, I think he was protecting him. Then, when I was 6 months pregnant with my 2nd child, we got up one day and my little Gizmo (who was now almost 11 years old) was bleeding when he urinated. We had just moved to FL from Nevada, and had JUST been able to afford to get the apartment we were in. So I knew this was not good. We rushed him to the nearest vet, and they told us that he had kidney stones. He needed immediate surgery which was going to cost $1500. We didn't have it, we didn't have credit cards to put it on, we didn't have family to ask or any friends in FL to help us. It was such an awful feeling to know we had to put him down. The vet said that was the only other option. I cried. I sat there with him while they did it, and I remember his big sigh when the pain medication had gone in, I cried so hard that I pushed myself into pre-term labor, and almost ended up losing my newborn too. I didn't have any other pets for a long time, because I didn't want a pet if I couldn't ever not afford to get it the care it needed. Gizmo's body was kept by the vet's office, I left with nothing. Nothing to remember him by, well, I do have a stuffed toy that was his that I cherish, but I wish I could have buried him. The vet asked if I wanted to take him home, but I couldn't deal with the thought of putting him into a box. If I had already had a Paw Pod, it would have been much easier, and now I am keeping a Paw Pod for my dog and my cat, just in case, for someday. Paw Pods eco-friendly, biodegradable pet burial pods and urns help provide closure for your customers during one of life’s most difficult times. 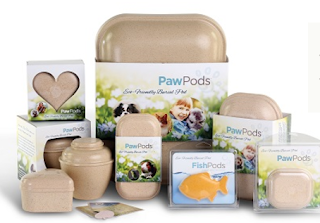 Paw Pods make the terrible experience of losing a pet better by delivering the body of the beloved family member in a dignified manner. 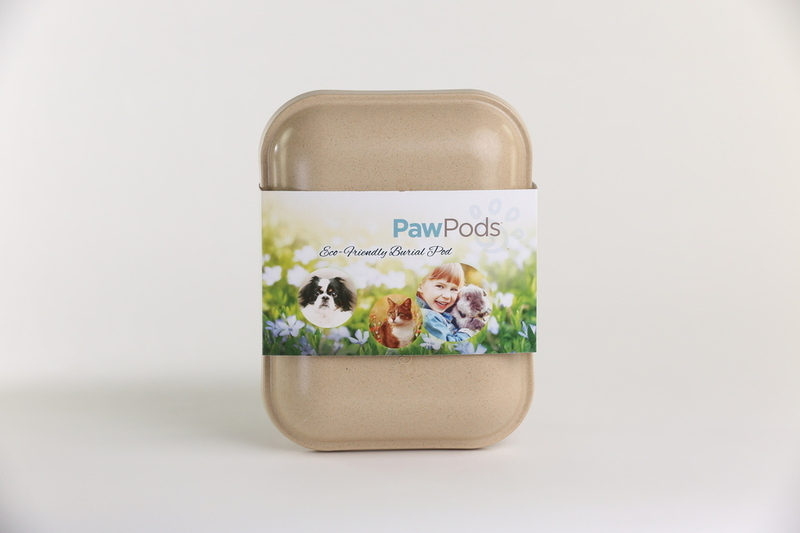 At Paw Pods we want to do our part to protect the environment. Our Pods are made from 100% biodegradable materials. Our remarkable durable pods and urns are constructed of bamboo fiber and rice husk. Each Pod is accompanied with a sympathy card and seeded leaf designed for planting with the pod to create a living memorial. Our green-conscious philosophy underlies all of our development and production activities. You can purchase Paw Pods at Bed Bath and Beyond or on Amazon. With so many size options available, you are sure to get the right one for your pet.